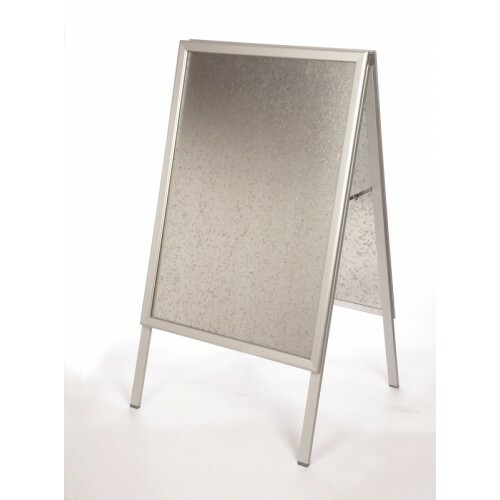 An A-board is an excellent way to display promotional materials, notices and other types of posters. The double-sided design provides the option to either have the same poster to be seen from both sides, or for two different pictures to be displayed, doubling the information on show. This board has a snap frame to keep the poster in place, which is quick and easy to open whenever you want to change the display. It is covered by a clear, anti-glare protective layer to keep your posters dry, safe and free from tampering. The aluminium and steel frame is strong and robust, and suitable for use indoors or outdoors in all weathers. The legs feature a locking system to help the frame maintain stability in all conditions, keeping it standing and showing off your promotional materials in style. A1 Springy Poster Frame Simple to use and double-sided for increased visibility, this poster st..